Everybody poops. It's a fact of life. 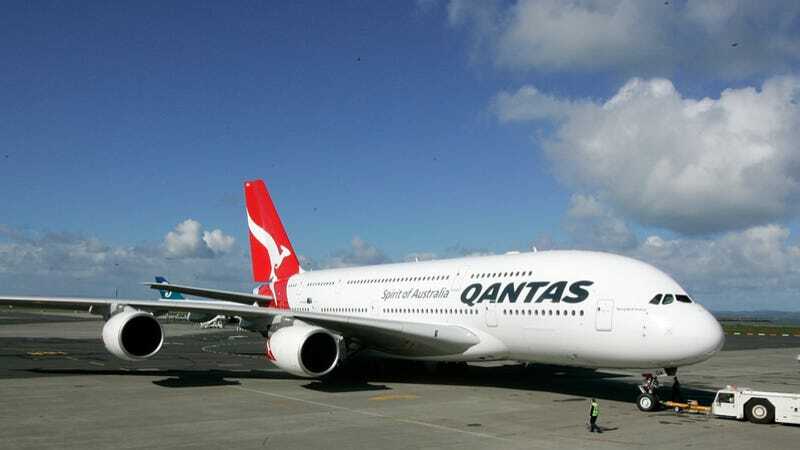 A Qantas flight from Santiago, Chile, to Sydney, Australia learned that the hard way this week when everybody pooped, for 13 hours, in a near-constant stream of bodily discharge when 26 of the passengers came down with a stomach bug. One passenger, Lisa McCormick, told the ABC that the teenagers were all from Melbourne and the regional Victorian city of Sale. She said they "unfortunately were rather sick for the whole entire flight. What a terrible way to end their holiday". "It just gradually wore through them all as the flight wore on, and it was 13 hours so it was a very long flight for them," she said. Sixteen of the passengers had to be taken to the hospital, and three of them were so sick they needed to be transported on a stretcher. Though the virus that created the brown nightmare for the group of Australian students and their teachers can take up to 48 hours to incubate in the human body, the outbreak itself began on the plane, which was fun, as the Boeing 747-400 on which they were traveling only has seven ten toilets. I imagine the whole thing devolved into the world's worst game of musical chairs, with only ten seats for 26 people who very badly needed one. And the music sounded a lot like "huuuuurrrgghhhhh." And yes, I know that's an Airbus A380 pictured above, as I imagine they're still hosing the Boeing down. Though maybe they should just burn it.